The partially convertible rupee ended at 51.9550/9650 per dollar, 0.5% stronger than Friday’s close of 52.23/24 -- its biggest percentage rise since 28 October. It touched an intra-day high of 51.8650, tracking a strong euro. The euro rose as investors used later-denied reports on Italy going to the IMF to unwind some bearish positions, with many still downbeat about the single currency’s prospects given scepticism about leaders’ ability to resolve the debt crisis. “Right now the situation is all if and but. 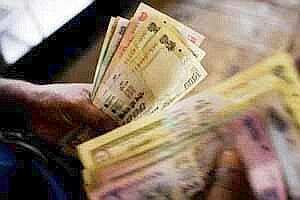 Unless there is a concrete solution to the euro zone, the rupee is likely to fall again," said Pawan Bajaj, deputy general manager of treasury at Bank of India. Shares posted their biggest single-day gain in three months, as investor confidence received a boost from the government’s move to initiate reforms and on hopes the euro zone debt crisis will be tackled with definite measures. On Friday, foreign funds had sold local shares worth $144.9 million. Traders said the rupee could strengthen to 51.75 on Tuesday if the euro holds at current levels, but oil bids are likely to cap further appreciation. Oil is India’s largest import item and oil refiners are the largest buyers of dollars in local market. For the week, dealers expect the rupee to trade in a broad range of 51.50-52.30 per dollar. “Month-end dollar demand from importers is expected, but Europe is the biggest problem," a dealer at a state-run bank said. Strains on India’s current account balance and the fiscal deficit have heaped further pressure on the rupee, with a Reuters poll showing investors have turned the most pessimistic on the currency in more than three years. Volatility in the foreign exchange market will remain until the euro zone crisis is resolved, India’s central bank governor Duvvuri Subbarao had said on Friday. The euro was at $1.3370 at end of rupee trade from $1.3228 at Friday’s close. The index of the dollar against six major currencies was at 78.884 from 79.596 previously. The one-month offshore non-deliverable forward contracts were quoted at 52.26. The one-month onshore forward dollar premium was at 27.50 points from 26 on Friday, the three-month was at 63 points from 58 and the one-year premium was at 162 points, from 147.75. In the currency futures market, the most traded near-month dollar-rupee contracts on the National Stock Exchange, the MCX-SX and the United Stock Exchange were at 52.2475, 52.2450 and 52.2425 respectively. Total volume was at $3.6 billion.